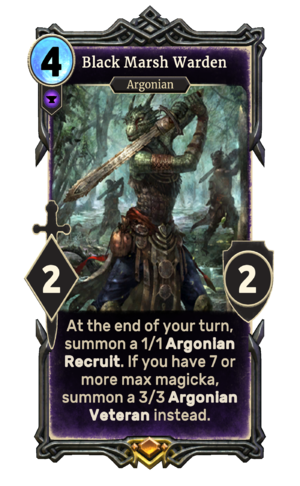 Black Marsh Warden is a legendary Endurance creature card. It is part of the Core Set. "I raise the spine of war!" "I do not fear them." "Your teeth have no bite!" The card is named for the nation of Black Marsh. This page was last modified on 15 February 2019, at 18:36.